In the Theatetus Plato writes, “philosophy begins in wonder” (155d). The Greek is θαῦμα which translates as “puzzle,” “problem,” or simply, a “marvel”. The definition suggests to wonder is “to solve a conundrum.” In this sense, θαῦμα carries with it an active puzzle-solving. Wonder is open to activity but is also somehow passive in its reflection. I say this because to wonder means both to reflect, to bring a thought into motion, and also, the active thinking of the thought, which we call roughly, the idea. The quip, then, “Philosophy begins in wonder,” seems to suggest a something that originates in a person who wonders, like the birth of an idea, and rises to the surface -- call it consciousness, and it is there, an eureka moment, “ah ha!” I got it! 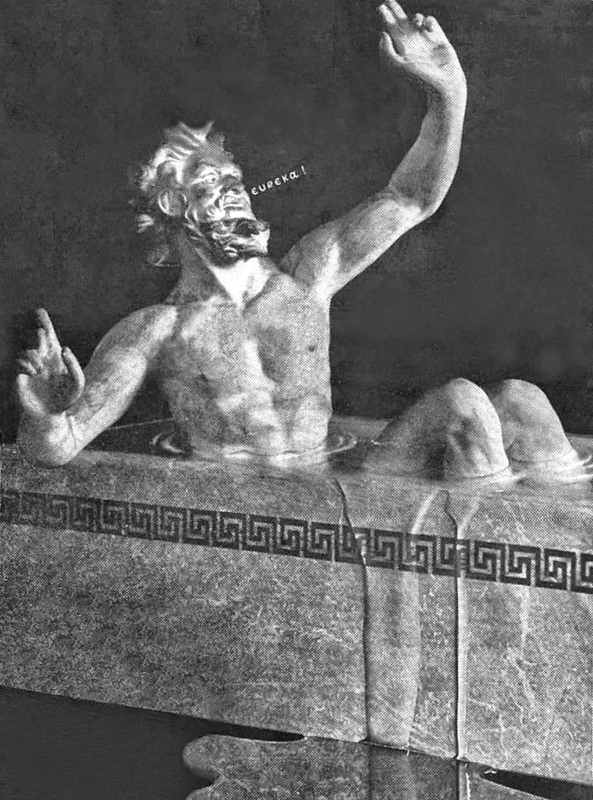 Archimedes sat in his tub, noticed that the water level rose equal to the volume of his own body. Before Archimedes’s discovery, an object’s displacement of water was a mystery, something to be puzzled out. Is wonder then what allows us to rise above Baudelaire’s animal who is stupid in his sleep? Wonder, then, is the origin of an eureka moment. Isn’t this what we do when we attempt to puzzle out questions of being? Wonder is both active and shareable. The original word, θαῦμα, does not have the denotation of “awe,” or, “inspired by greatness,” but means rather the locus from which the philosopher first begins. Wonder in the verbal sense, in the philosophical sense is not the Latinate word for wonder, miracle. I am enclosing wonder in its Greek etymology. To wonder is to have the capacity to even begin philosophical thinking. Wonder is a beginning point and not a response to a world that necessitates somber recognition. Wonder catapults us into the abstract -- into the mode where philosophy is staged -- to engage with the world. Wonder is an active principle, and not reducible to a mere passivity. 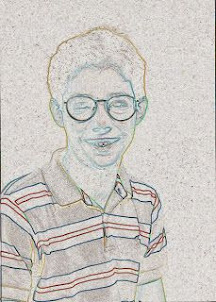 Wonder generates the possibility to stand outside of our own cognition and to make comment on the world and ideas. Wonder necessitates response. Wonder involves a response that forms the very kernel of philosophy. Wonder allows us to interactively reflect on the purpose of philosophy itself. Philosophers ask, “what does it mean to philosophize?” Philosophers ask us to think about ourselves from an anthropological point of view. What makes the human being capable of asking questions about its own being-in-the-world? Wonder makes meta-thinking possible, to think about thinking. Philosophy then becomes a reflexive activity that essentially spurs thought, brings it forward out of the mind, into the the broader community of thinkers. In this way, the philosopher is not the stereotypical navel gazer who is lost in his Matrix movie worldview. It is erroneous to think of wonder as solipsism, the monist philosopher, the brain in a vat. Wonder is the epistemological step to us as thinking beings. Rational creatures, like humans, can wonder -- contain within themselves the capacity to think beyond themselves -- which means rational creatures can think about their being and their own death. By extension, we can share our experiences, our reflections with others. It is in this way we create a human community. It is a dance between solitude, an inner stirring, and entering back into the human circle, that constitutes our wondering, what makes our wondering shareable, and gives our philosophy a sense of work and collaboration. We can wonder together about these issues. 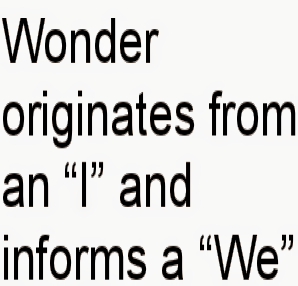 Wonder originates from an “I” and informs a “We”. As I have already said, Wonder is an originary function of philosophical inquiry. We tend to speculate on many things in philosophical, intellectual circles. But we seldom reflect how we came to this thinking called wonder in the first place. Seldom is it asked, ‘where does this capacity spring from in the first place?’. Modernity -- in which I mean anything after Kant -- emphasizes the privilege of the thinking subject. It is in the twentieth century, perhaps with Heidegger, who rigorously rethought the question of being, not from a God’s point-of-view, but from the vantage point of the human being. With Dasein, the subject who ponders being, “why is there something rather than nothing,” the question of wonder takes on a subjective shape. Heidegger speaks of the capacity to wonder, it could be said, when he lays a foundation for how Dasein is even capable of philosophizing. Heidegger’s beef is no one has ever really put into argument how we come to philosophize in the first place. How is the capacity to wonder even possible? When Heidegger writes about the facticity of dasein as an a priori condition of its own being in such a way that one has an understanding of Being, he is speaking about the conditions of wonder. 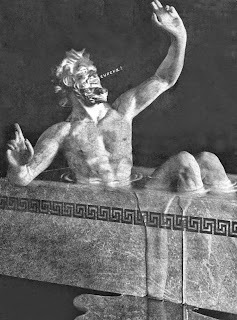 The Greeks, as I have said already, regulated the philosopher to leisure. In the Middle Ages, philosophy was a necessary servant to theology. Descartes, and leading up to Kant, gave the cogito an exalted status that truncated thinking from its progenitor, the human being. In the apex of Enlightenment the hegemony of thought held sway, right up to the powerful seduction of contemporary science. Heidegger was the first to question the possibility of wonder. Dasein, then, Heidegger’s metaphysical interlocutor, is the human being himself, in time, who is able to carve out for himself, and for others, the intricacies of being. Heidegger understands the question of being by first looking at the subject who is capable of articulating the question of being in the first place, namely us, human beings. Dasein allows for being to be thought of as both coming from an originary space, and also extends being to a shareable discourse. Wonder, then, is an architectonic by which we begin to even start asking philosophical questions. Wonder builds from wonder into thinking and by extension, into engagement with the world. We think of the philosopher’s tool as an inward dialectic, as if wonder, is presupposed to think inwardly. While I think this is true, it is a fundamental flaw of reason to mistake wonder with introspection. Wonder is inextricably designed to be outward in its structure while introspection is not. Wonder is a capacity, shall I say a capacity that makes it even possible to be what we call thinking-beings. Dasein is possible by virtue of wonder. Wonder is not and cannot be an inward action that precludes activity with others. In wonder, the philosopher begins to build a worldview. Without wonder it would be impossible to pose questions about the world, nature, the I, God, and others. Without wonder, without a conception of human beings who wonder, there is a disabled view of how human beings can interact. Another analogy of wonder is the child. The birth of the philosopher can be traced back to a moment in childhood. The child asks, “What happens after death?” Or Leibniz and Heidegger’s question, “Why is there something and not nothing?” From wonder, the child relinquishes himself for the first time from dependence on another and begins to formulate questions that softly form his or her own identity. The capacity to wonder fills another function which is to leave the imaginary fold of dependence and enter into an interdependence within a community where ideas can be shared. Society hinges on the failure or success of the human subject to master his own misformed subjectivity. A subject without the capacity to wonder would be one in which the world poses no marvels. There would be no interdependence. Only monism. Without wonder there community would not exist because people would not have the impetus to propel themselves outward, so to speak. Since human beings have the capacity to wonder, it is part of our cognitive origins to seek out answers to the most basic questions. Wonder is a necessary narcissistic wound. As I said earlier, wonder is shareable. Just as Archimedes had his moment of clarity, so to does his wonder extend beyond his own thinking and becomes a shareable wonder with others. The import of Archimedes’s unpuzzling is the precision by which volume can be measured. In a way, wonder makes possible a community of inquiring people. It is the capacity to wonder, to puzzle out, that inspired the early polis to organize groups of people together in the streets to philosophize. The community of thinkers, what Dante would call the virtuous pagans, through the leisure granted them to wonder, discuss in dialogue the ideas they have mulled, or ruminated, in their heads. In a less romantic way, wonder is seen by the school teacher who sees his student’s face light up when they realize an answer. Or, it is the child, who discovers language, that a word corresponds with something in the world. Wonder is that orginiary birth of an idea that sparks a piece of art, or an idea for a thesis. Without wonder, Newton would never have been able to even to bring into his consciousness the law of gravity, or Copernicus, a heliocentric universe. Wonder does not ground any of this. Wonder is not a reason or an understanding. Wonder is a starting off point. Wonder is the birth of an idea. I turn to you, another being who wonders, not as a dead thing in a room, but another wondering being with whom I can begin. Philosophy begins in this wonder.